Designed specifically to fit the SIG 550, SG551, SIG 553 & SIG 552 Series SANS Rifles & Pistols. I only made a few of these so they are a little more expensive than the taller one for the SIG 556 Classic Series. 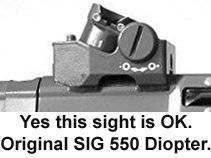 This height is what you would find on any SIG 550 (PE90), SG 551, SG 552 & Swiss SIG 553 rifle or pistol that has either: the WELDED on rear Swiss Diopter / Drum sight or the Original circa 1980s in the rail nail file sight found on some of the SIG SANS SG 552s. The blade is narrower at the top than the original Swiss 552 sight to a standard Target Width of 0.080" wide, which vastly improves your ability to see and track. It also allows the shooter to have a more pin point accurate choice of bullet impact. We have copied the original Swiss SIG SANs SG 550/1/2/3 (PE90) Non-Hooded Flip Up Front Sight in almost every way so that you get the lowest possible obstruction when the sight blade is in the down position. 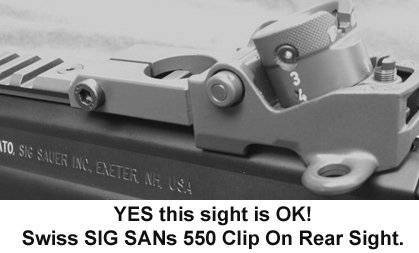 This is ideal when running an open style red dot or lower power scope. 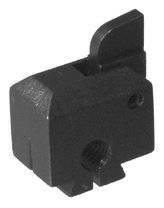 This will NOT line up with the MFI MAD Rear Sight or any SIG USA produced rifles, pistols or sights. Improved Positive Lock Up & Down. (Hex Key) Adjustment for windage. Does NOT Include Front Sight Wheel / Bolt Windage Adjustment. Weapons Grade Steel / Mil. Spec. Black Oxide Coating. The front sight's dove tail must slide somewhat freely in the dove tail of the gas block. Meaning: You should NOT have to use a hammer to drift the sight side to side, but it should also NOT be so loose as to slide easily. The right amount of friction is so that the sight drifts sideways via a significant amount of force using your fingers... i.e. nearly all of your might using both hands(tightest) to as easy as half of your strength (loosest). The idea here is that the sight has enough friction in the dove tail not to move during firing. Failure to do this WILL result in the stripping of the cross-over bolt or the shearing of the roll pin inside the donut / round nut. Hand fitting is required as the dove tails in the gas blocks vary from production to production. Hand fitting can be done via a small hand file used on the slanted edges of the sight's dove tail. How to install the roll pin in the front sight. It is easy to mess up the roll pin when you first try to install it. Read below to avoid the pitfalls. Not all SIG 556 series weapons come with a front sight installed. So issues like this arise most often when the user is NOT first removing a similar front sight from the weapon and thus is completely unfamiliar with the requirements. There is a first time for everything and that is a part of any weapons system. Be sure that the hole in the donut and spline are clean / free of metal shavings. The most common mistake that leads to messing up a roll pin is not having the hole in the spline / adjustment bolt and the hole in the round / donut wheel lined up. You will have to use a punch or something to be absolutely sure of the alignment. Use a 1/16” punch or 1/16” drill bit or 1.5mm allen key… or look around the house and shop for something that fits through both. The number of turns to get the holes lined up is between 2.5 and 3 full rotations (you have to look down the hole). 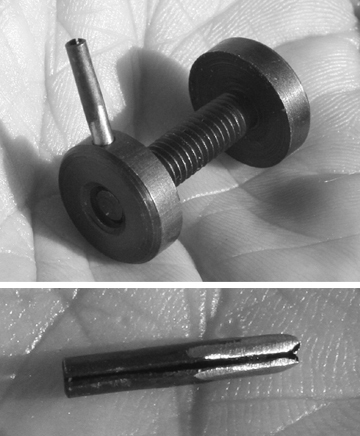 The windage bolt should NOT go past the point of being flush with the outside edge of the donut. It is a lot easier to file or grind down the roll pin at one end and then gently collapse the same end with a vice grips of pliers so that it just fits / sits in the hole of the donut. This will free up one hand. This is almost a requirement. Lube the hell out of the roll pin and hole of the donut and spline. Always start with your 1/16” punch (or whatever) 3/4 the way through to assure alignment. As you drive the roll pin in the punch will move out the opposite side. MFI hit this one out of the park! I bought this one without the adjustment wheel as I had an original SIG SANs wheel set already (so saved some $$$). Mounted it in seconds on my SIG 553 SBR, centered it with the line on the sight and gas block and it shot dead center at 75m without any adjustment (gun was previously zeroed) and I am runinng the welded on diopter. Great product at a SUPER PRICE!!! Works perfectly, super fast shipping and outstanding price!! Quality workmanship, I can really tell that this is a USA product. Why by Swiss when this is as good if not better at half the price? Below is my review of the MFI Diopter Rails. I also bought this sight to use while I wait for the MFI Hooded front sight to come in. I have been following this product for years and I cannot thank Mike at MFI enough for sticking with this project. I know how many problems he has had over the years with this. Anyway I got one of each color, Black and Gray. So I will double post this on the other color too. Fit is perfect. So easy to install and what a differance it makes. The black is almost a perfect match to my SIG 556 upper. Swiss style markings make this product even cooler. Love the Swiss Cross. I have only test fired perhaps 250 rounds as I just got this a day ago. Works perfectly at 100 meters. The 200m position on the drum appears to be right as well. I an not sure as I am using military ball ammo and I do not normally shoot past 100m anyway. I also really like the fiber optic option. I ordered the front hooded sight as well, but as I was in such a hurry to get one I bought the MFI non hooded SIG SANs flip front sight and everything lined right up and dead on. I cannot wait for the hooded sights to get in. On the Gray Diopter... well this one went on my SIG 551A1 from CDNN and the color match is very close and may be perfect, but the MFI rail color is sort of a semi matt finish where my receiver and lower are more flat. Still way better that the rail that came with the 551A1. I also put the Black rail on the 551A1 and as I have black Swiss furniture on the 551A1 the black MFI rail actually looks great and not out of place at all. I have not shot the 551A1 yet. Fit and finish are superb. I do not mind the casting marks as they are a reproduction of the originals I am told. Again... THANK YOU MFI... a small company (one guy I am told) really came through!